Say goodbye to all that slime, mould and algae that builds up on your patio slabs! Using Easypave’s resin bound stone for your patio has all the advantages and none of those problems, no need for jet washing every year as you normally have to do on conventional patio slabs. 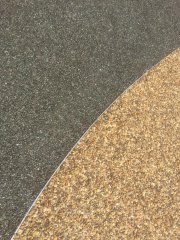 You can have your patio any size and shape you want and in any colour stone you wish, you could even have different patterns or borders by simply using our edging profile strips to form the shapes and then filling with a different colour stone. You might also be pleasantly surprised at the price! We are based in the South of Wiltshire, in the city of Salisbury. We have decades of experience, and know that when it comes to paving, industry knowledge equals fantastic results. We are the best choice for all your paving requirements, so please don’t hesitate and get in touch today, to discuss your project and how we can help.